The article discusses the changes that the pharma industry is facing as companies shift their focus from mass producing generalized medications to delivering targeted therapies. This is particularly true in aseptic processing, where the need for a robust containment strategy is becoming increasingly complex, especially as companies work with small batches of new kinds of therapies. Because companies are working with small batches of personalized medicines, they must worry about the economic fallout of contamination or corrupting a sample from the patient. The rising demand for high potency active pharmaceutical ingredients (HPAPIs), which require specialized handling, also adds pressure on the supply chain to provide reliable containment solutions. Due to these changes and challenges, innovative operational solutions are required for these new manufacturing methods. The Growth Direct System from Rapid Micro Biosystems was cited as a unique innovative solution to contamination challenges. 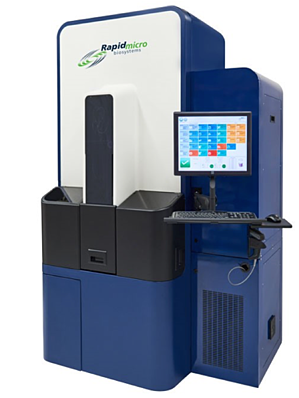 Growth Direct is the first and only growth-based microbial QC detection system to automate compendial testing. Growth Direct incubates, enumerates, and reports the final microbial count 50 percent faster than the traditional method. The Pharmaceutical Manufacturing article also discusses how changes in the weather can trigger new problems in the manufacturing space, including the growing risk of mold, which can spread quickly and be tough to remediate. By automating microbial quality control, Growth Direct delivers rapid detection of mold to provide real-time actionable data, allowing companies to increase operational efficiency while maximizing patient safety. As industry and patient needs evolve, equipment manufacturers such as Rapid Micro Biosystems, with its Growth Direct System, are helping pharma companies successfully meet and overcome new contamination challenges. To read “Product Focus: Smarter Contamination Control: Big ideas are meeting the challenge of manufacturing in a tighter space,” click here. Learn more about how Growth Direct helps pharma companies meet new contamination challenges.